Webinars are not for sale, this feature is coming soon. Learn how to structure and manage our covered call writing and put-selling portfolios when market forces are bearish in nature. Stock and option selection as well as position management skills will enhance our opportunities for success and provide protection to assist in our goal of capital preservation. The Poor Man’s Covered Call is a non-traditional way of using covered call writing at a reduced capital outlay. Its technical term is a long call diagonal debit spread where long-dated options known as LEAPS are used to replace stocks or ETFs. The cost of buying LEAPS is much less than that of purchasing stocks themselves and so the outlay is much less and potential return on capital can be significantly higher. Like all strategies, there are pros and cons related to this strategy and specific ways to set up and manage trades. There is no free lunch as some would expect when simply looking at the definition of the strategy. This presentation will get into the specifics of the strategy and provide information (I believe) found nowhere else. 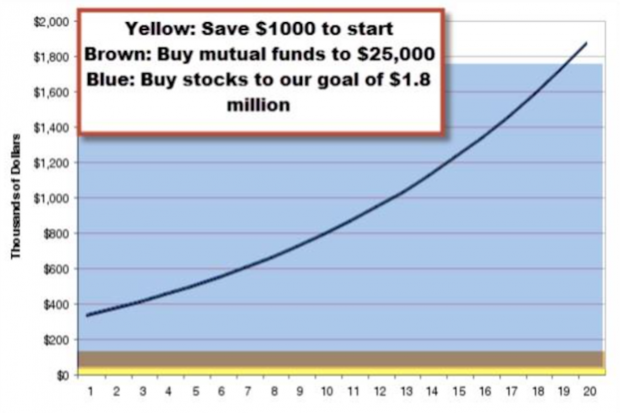 • Why favor index mutual funds? Using a savings calculator, conservative historical statistics and basic financial principles you can retire at age 58 with $1.8 million. The key is to start at a young age and use the power of compounding, the 8th wonder of the world. The techniques presented in the webinar are for everybody because they are user friendly and self-motivational as our youth watches their portfolio grow larger and larger as will their confidence and quality of life. This is my hope and my dream. Covered call writing and put-selling are conservative option strategies which provide means to generate monthly cash flow. In my books, DVDs and journal articles, there have been discussions of how puts can also be used to buy stocks at a discount or to protect against substantial price depreciation. In this webinar, a strategy will be proposed using puts to both buy and sell stocks so as to provide protection on both the buying and selling aspects of our stock portfolios. Once the shares are “put to us” an out-of-the-money protective put is purchased giving us protection against catastrophic share depreciation. Put options are generally used to generate monthly cash flow but can also be used to buy a stock at a discount and to protect against catastrophic share depreciation. Learn how to increase portfolio returns by selling stocks options while simultaneously reducing the risk of having low cost basis and dividend –producing stocks sold as a result of the option commitment. This webinar will demonstrate how to generate monthly cash flow by selling options while at the same time continuing the flow of dividends from our shares and still retaining our shares and dramatically reducing the risk of tax issues despite our option obligation. Defining option selling parameters based on overall market assessment, chart technicals and personal risk tolerance. Covered call writing is a flexible strategy that can be crafted in many market environements and investor goals and risk-tolerance. Covered call writing and selling cash-secured puts can be used to generate monthly cash-flow or to buy a stock at a discount. 5 actionable strategies are discussed including covered call writing, put-selling, portfolio overwriting, the zero dollar collar and the “PCP (Put-Call-Put) Strategy.